I’m back! I missed you guys, and thank you for staying around (and catching up with me on Instagram) while I was out and about. I’m back from my vacation and boy oh boy, this vacation was one for the books. I’ve been to other cities in Spain before (Madrid, Cordoba, Seville, Ronda, Costa del Sol, Granada, and Toledo) but it was my first time to visit Barcelona. I was mesmerized by the entire place. I did my research and talked to plenty of friends and family for advice on things to do and see and eat, so I had quite a few things on my list. Top of the list, of course, is food. 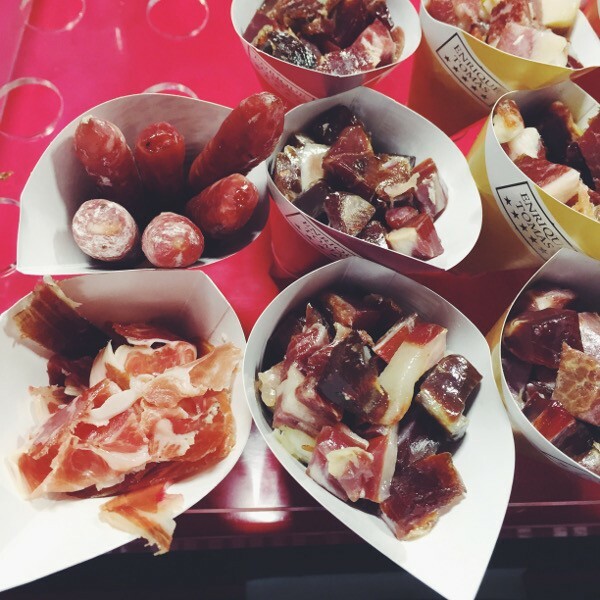 Like my last trip to Spain, I ate jamon iberico everyday. 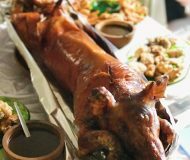 Salty, silky, with an intense luxuriousness and a nutty aftertaste – it was pure perfection. I also ate chorizo everyday, mostly as a montadito from tapas bars, or from the little snack cones sold all over the city. 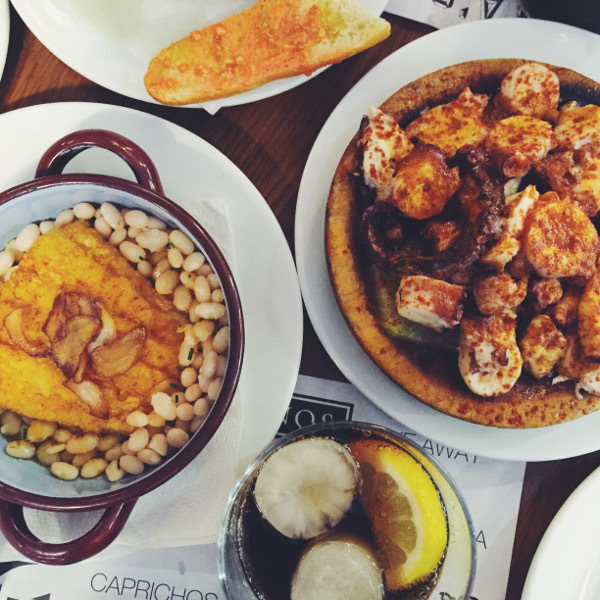 Here’s a quick Spanish food glossary: tapas are snacks (small plates), pintxos are small bites on sticks, and montaditos are food on bread, or little open faced sandwiches. I went on vacation with two of my girl friends, Fe and Mildred, but I’ll spare you the three dozen selfies we took … except for one or two. 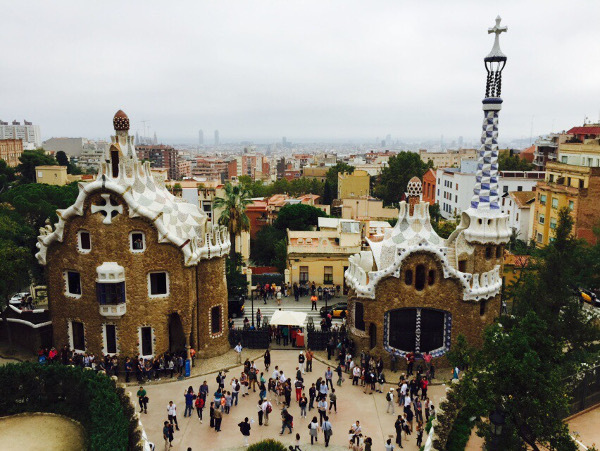 Barcelona to me is synonymous with Antoni Gaudi, the famous architect known for Spanish/Catalan Modernism and his free-flowing style influenced by nature. 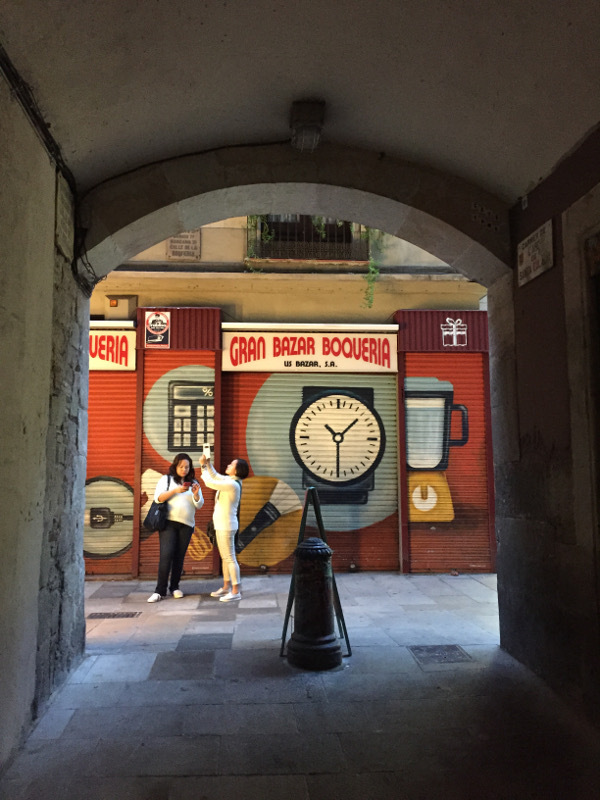 His work is all over Barcelona, and it is exquisite. 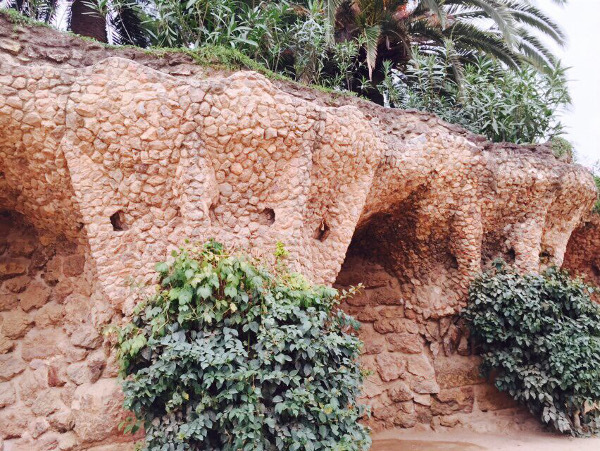 The picture above is but a small part of Parc Guell, a breath-taking public park. 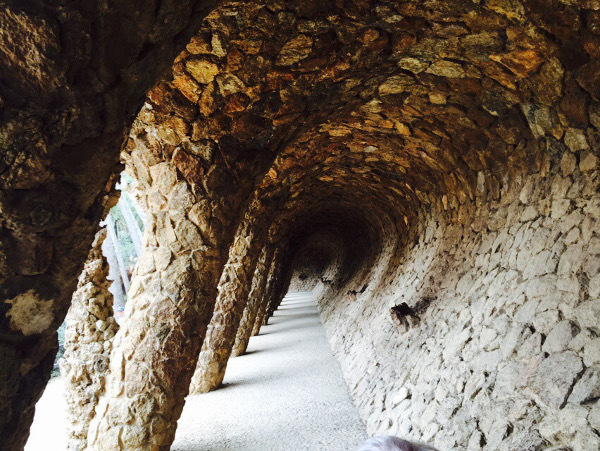 Parc Guell reminds me of a Dr. Seuss world, but even better. 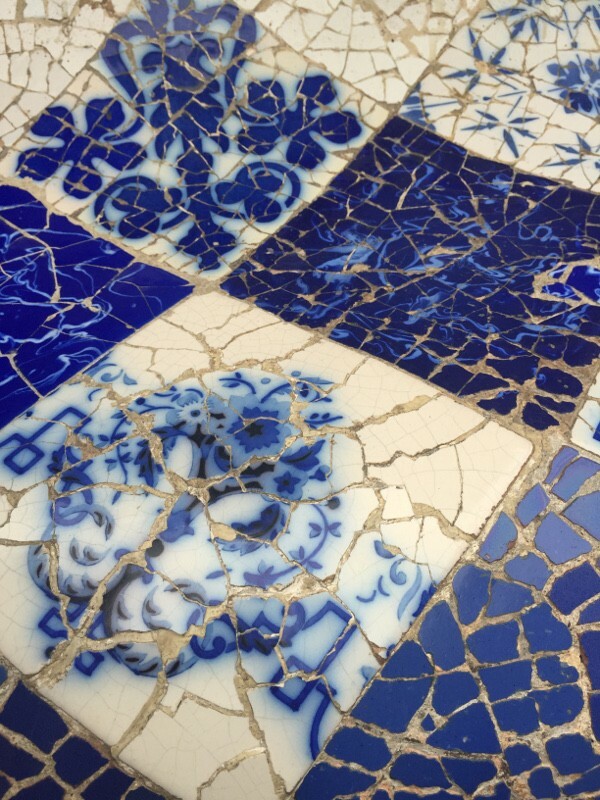 The tile mosaics were just incredible and there was just so much attention to detail in every nook and cranny. Gaudi’s work was my favorite part of the trip, and these pictures do not do justice to the beauty and madness of his architecture. I do not subscribe to minimalism so all these colors and wild shapes appeal to me. 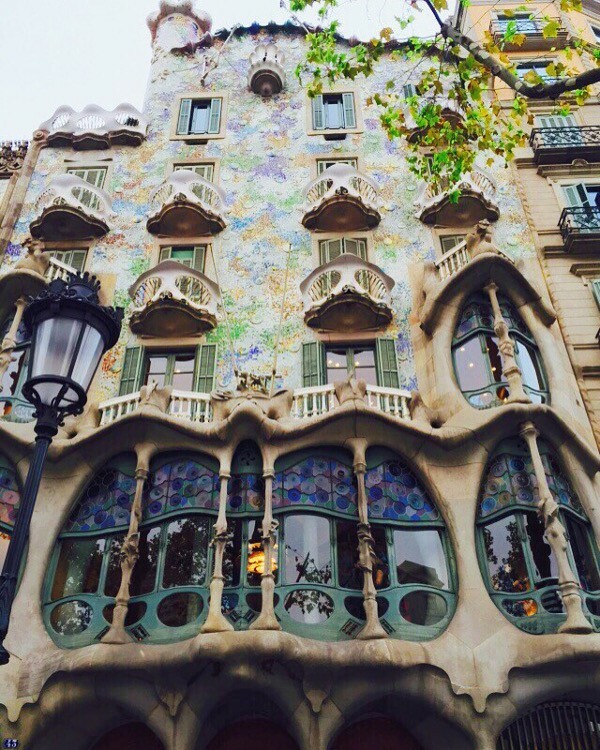 We checked out Casa Batllo, a Modernist museum right in the center of Barcelona. Just look at that amazing tile-covered facade! And we went to La Pedrera or Casa Mila just a few blocks away. 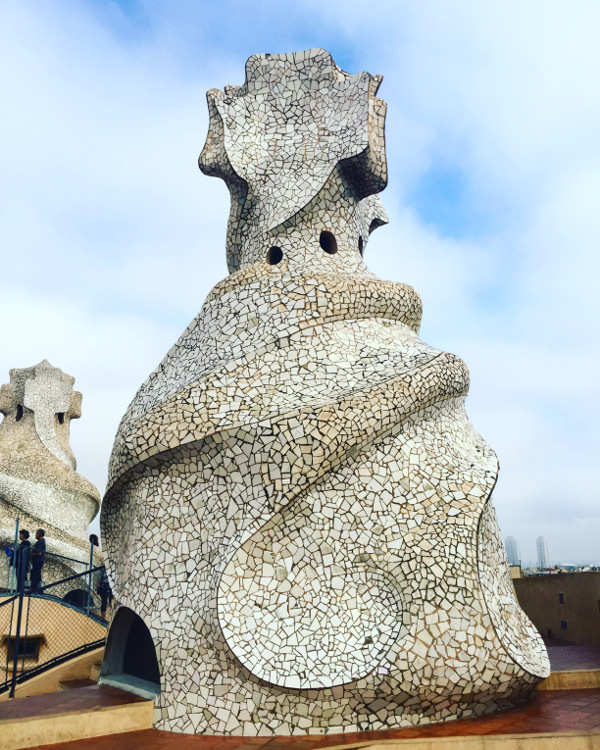 I greatly enjoyed the rooftop of La Pedrera, and kept gawking at these sculptures above because they remind me of storm troopers. But Gaudi didn’t make these as a nod to Star Wars, they are actually ventilation ducts on top of the roof, meant to resemble roman soldiers. 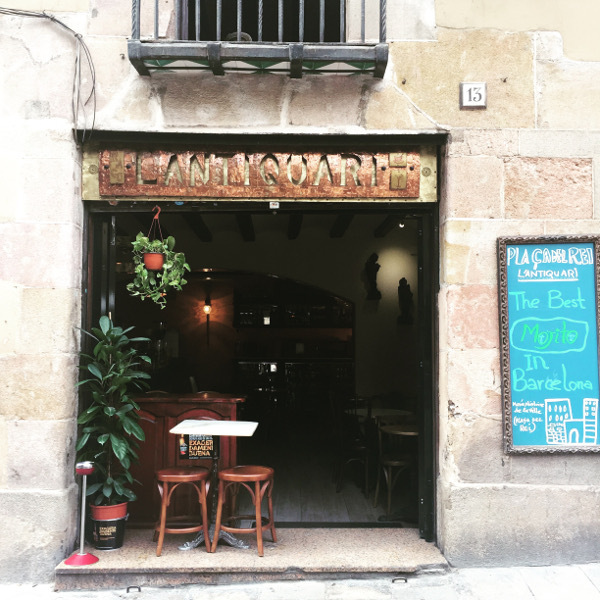 There was so much to see (and eat) in Barcelona, and the entire place just pulses with character. The city comes alive at night, and my friends and I frequented La Rambla, a street lined with restaurants, bars, and shops. 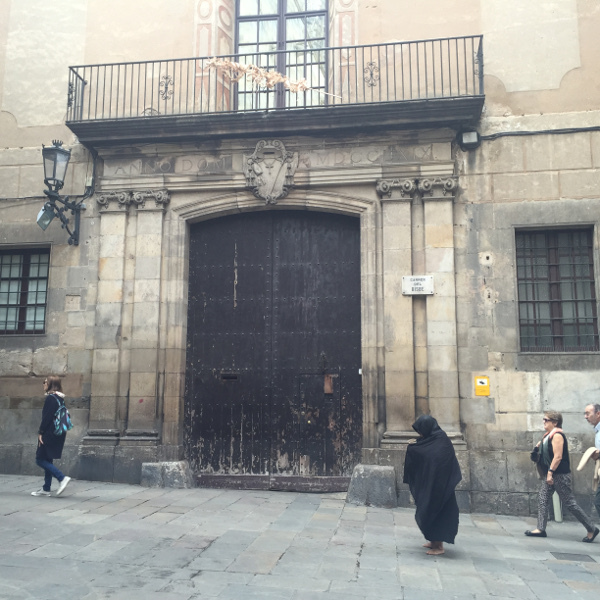 We walked everywhere, too, from the Gotic and Jewish quarters, the markets, and all the little cafes. Of course, our trip was not lacking in food. 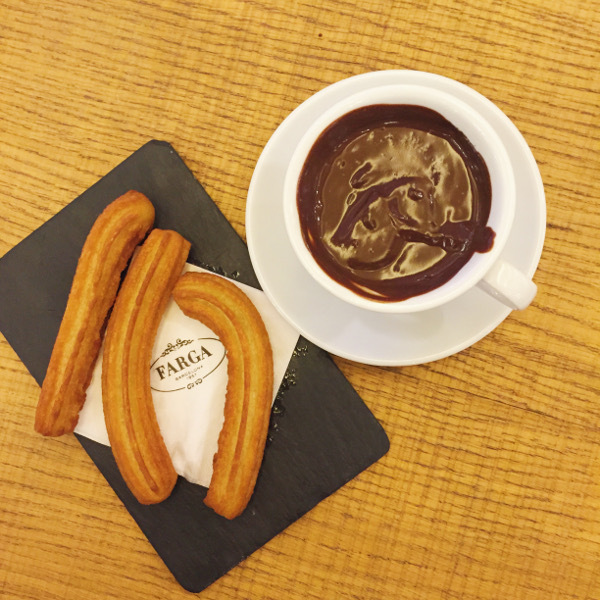 We ate more than just churros. 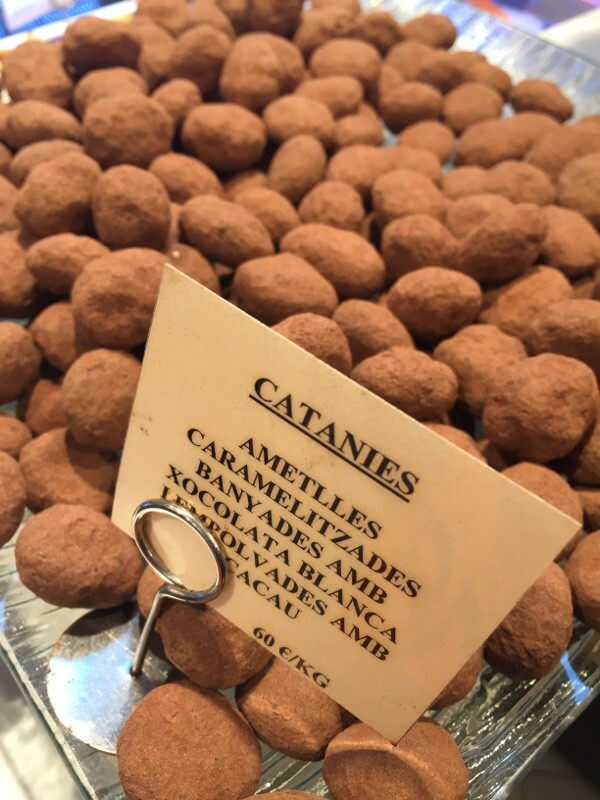 One of my favorite food discoveries at Barcelona were these toffee and chocolate covered marcona almonds called catanies. My friends and I tried it on Day 1, and I immediately bought a few bags and ate a handful everyday. 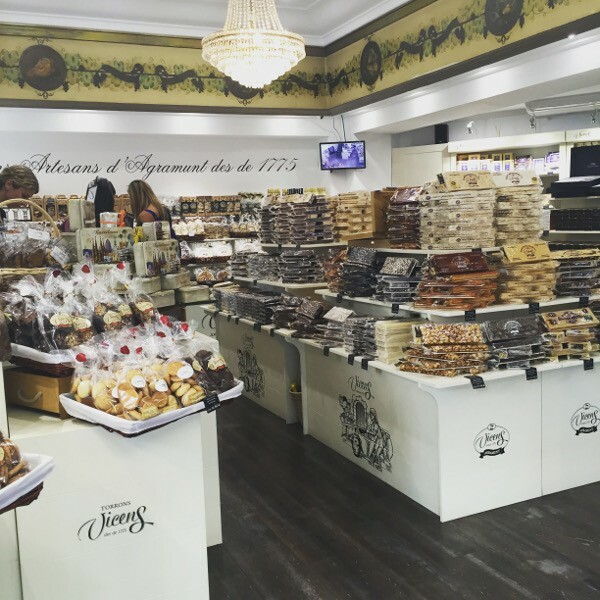 I was also a big fan of torrons, or nougat. I brought back a couple of bars of the Crema Catalan ones, which is Barcelona’s premiere dessert. Crema Catalan was like a cross between a flan and creme brulee. Yum. And of course I loved the tapas. We tried several tapas of the regional specialties (top photo), bacalao (salted cod) and pulpo (octopus served with sliced potatoes and paprika). The bacalao was soft and buttery and perfectly cooked. And so was the octopus – I never would have thought to describe octopus as buttery, but it was. Our every meal was washed down with sangria and more wine, which was cheaper than water. 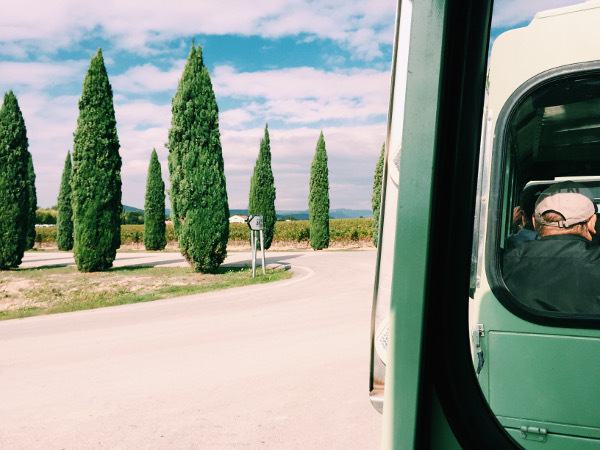 Speaking of wine, we ventured out of Barcelona for one day to go to the Penedes region for a Wine and Cava day trip. I felt like I was in a movie set, with the lush fields and wineries and very picturesque setting. 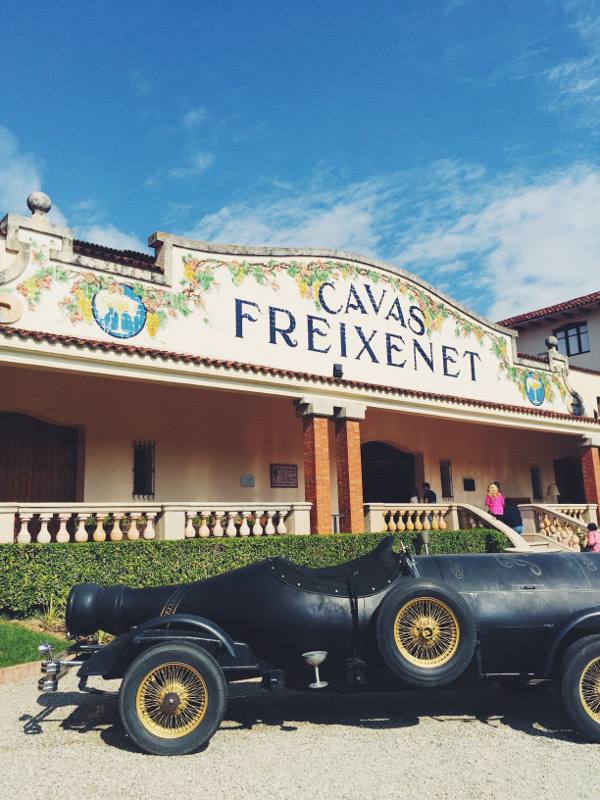 We went to several wineries, sampled multiple glasses of wine and cava, and ended up at my favorite cava producer, Freixenet. 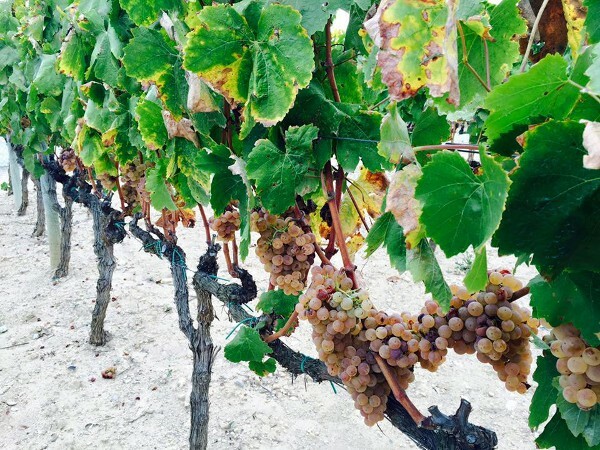 Cava is sparkling Spanish wine, similar to champagne, and I always have a bottle at home. Because I like making ice cream floats with cava, and also because it makes me feel fancy. Now I love it even more after going to the winery. My friends and I had such a memorable vacation in Barelona, and I enjoyed every minute. The people there are so friendly. They speak Catalan, which is different from Spanish (it’s closer to French) but they would switch to Spanish to converse with me. The people, the architecture, the food, the drinks, I soaked it all up and would absolutely want to come back some day. 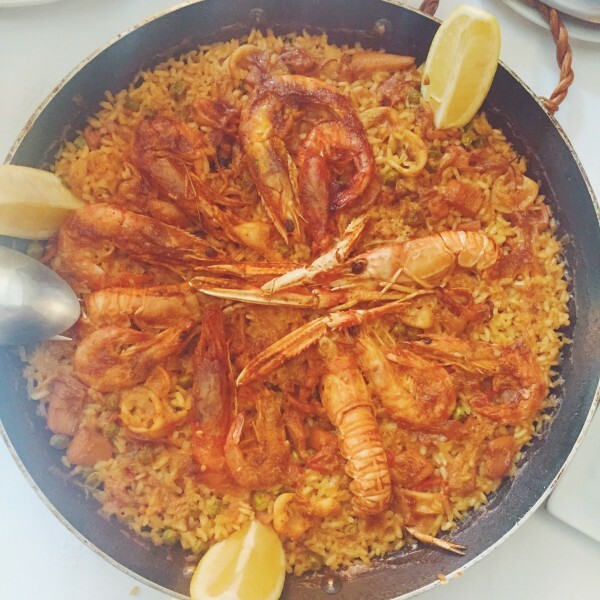 Oh and of course we ate paella. Lots of it. This was just one: seafood paella with shrimp, langostines, calamari, and cod. I’ll be back next week with something sweet! 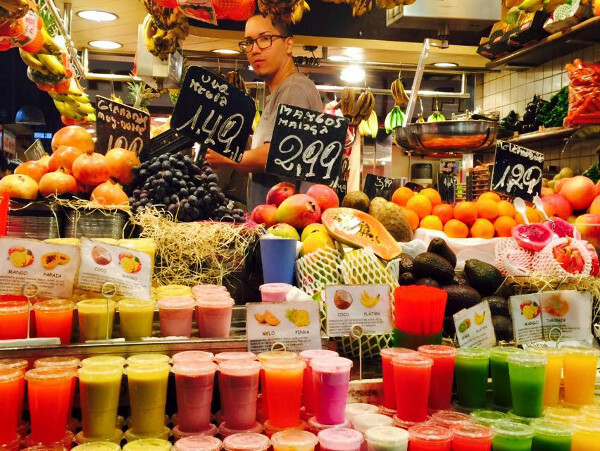 I loved following your Barcelona Travels – every Instagram made me jealous! Gaudi was definitely one of my favorite aspects of the city. His work is something else. Glad you at lots of Paella and churros and Iberico Jamon!! Thanks Daisy! 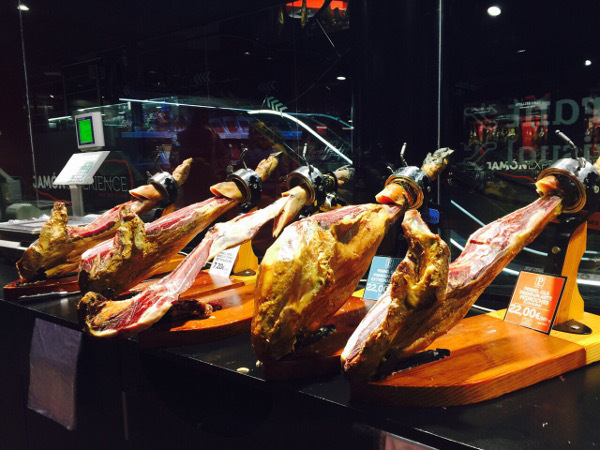 I wish I could’ve brought home all the jamon! What a wonderful trip! Thanks so much for sharing your photos. I have wanderlust again and just have to book something so I can dream about it – this looks perfect. Thanks again! Hi Tricia! Yes I definitely recommend looking into Barcelona for your next trip! Yay! 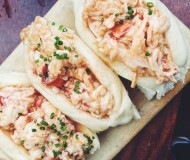 So happy you’re back and blogging about all your foodie adventures. I studied abroad in Spain and Barcelona really is incredible. The Gaudi buildings are spectacular. 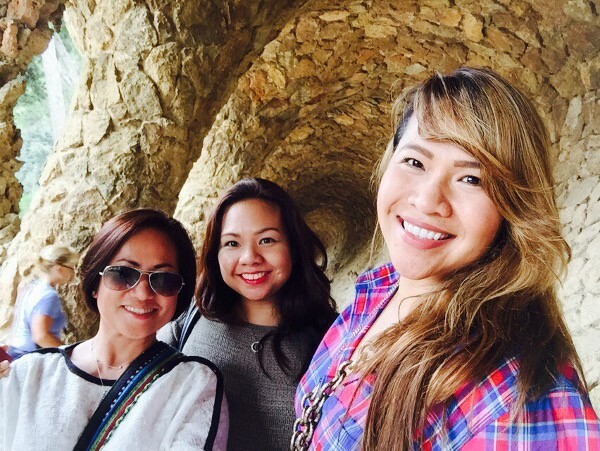 Parc Guell is one of my favorite places on earth. 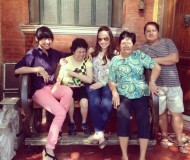 Looks like you ladies had an absolute blast! Wine was cheaper than water? I need to go here!! ;) Looks like a wonderful trip! Loved looking at your photos! 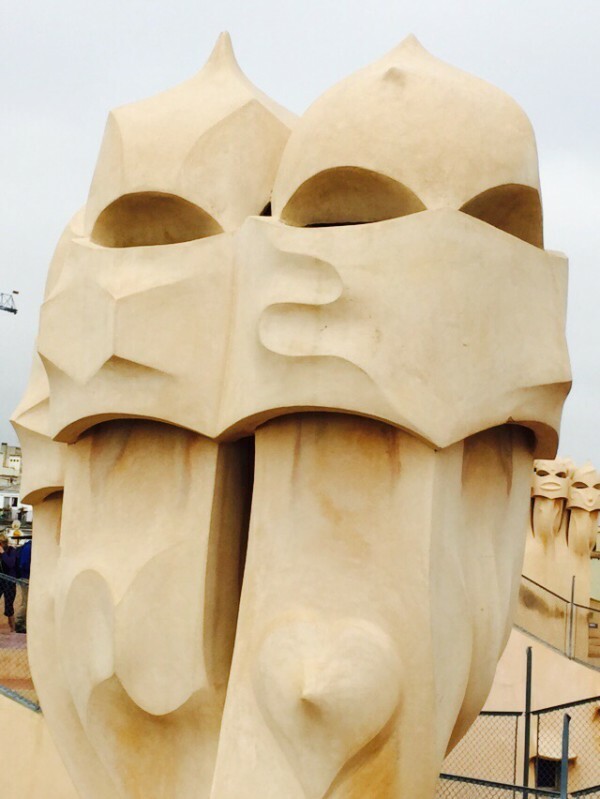 I went to Barcelona for just a weekend and also was in awe of Gaudi’s work, especially Sagrada Familia. It’s absolutely on my list to visit again soon (and for longer!) with my hubby. This post will definitely come in handy. Glad you had a great trip! I love Barcelona! Your photos are gorgeous, and everything looks delicious! i can’t think of any occasion that would take me to barcelona, though i’d love to go! so thanks for sharing your pictures–it looks very vibrant and fun through your eyes! 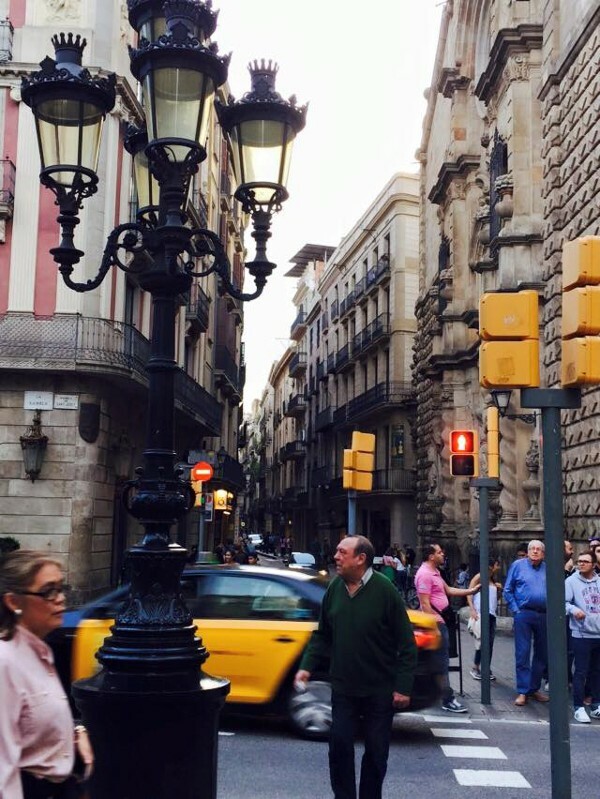 i have heard so many amazing things about Barcelona….this post makes me so happy! and of course the paella. 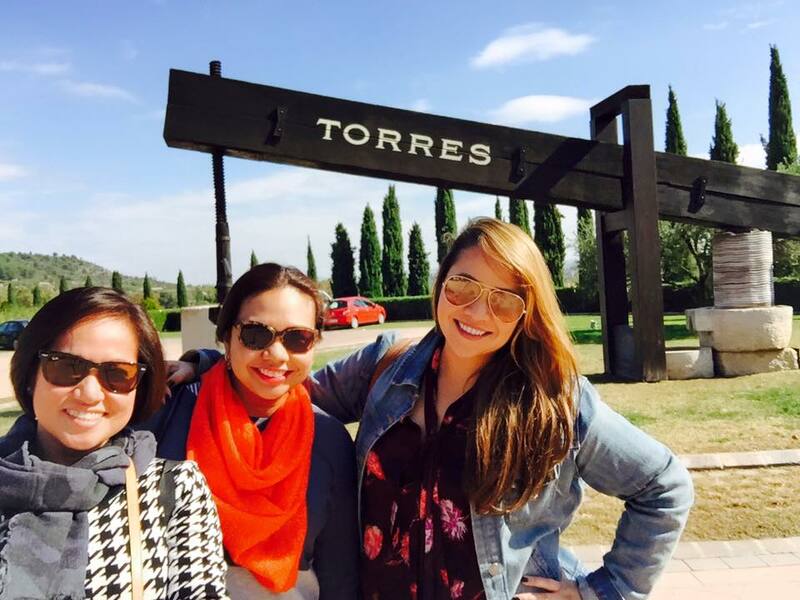 I love your piece about Barcelona, ms bianca. Barcelona is one Spanish city you can never get enough of, really. I hope I’d be able to visit it again next year, God-permitting.